Effective December 1, smoking is prohibited in most restaurants and bars in Virginia and proprietors are required to "post signs stating 'No Smoking' or containing the international 'No Smoking' symbol, consisting of a pictorial representation of a burning cigarette enclosed in a red circle with a bar across it, clearly and conspicuously in every restaurant where smoking is prohibited…"
Browse our selection of Virginia No Smoking signs. Our State-specific No Smoking map quickly and easily takes you to signs designed for your state, including any required phone numbers or web addresses. 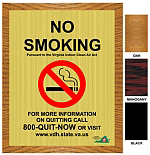 View all our No Smoking signs. Read Virginia Dept. of Health FAQs on the ban.